Home monitoring can help detect wet AMD earlier to reduce the time between disease onset and initiation of treatment. Anti-VEGF monotherapy as a management strategy to treat patients with wet age-related macular degeneration (AMD) has dramatically improved the prognosis for these patients over the past decade or more. Visual acuity (VA) outcomes, however, have leveled off. We can address this by identifying disease earlier and initiating anti-VEGF therapy sooner: that is, when choroidal neovascularization (CNV) lesion size is smaller and starting VA is better. • VA at the time of wet AMD diagnosis is the best predictor of VA outcomes after 1 and 2 years of anti-VEGF treatment. • Most patients start treatment for wet AMD when their VA is already worse than 20/40. • For patients, what truly matters is a visual outcome that preserves their functional independence for reading, driving, and daily activities. Clinical trial data from the past decade, derived from several studies with large sample sizes, reveal that only a limited number of eyes with newly diagnosed CNV were detected when VA was still relatively good (Figure 1). The proportion of eyes with 20/40 or better VA at CNV diagnosis ranged from 13% to 41%, reflecting different VA inclusion criteria for different trials. Given that the majority of patients start treatment for wet AMD when their VA is already worse than 20/40, we have an opportunity to catch the disease earlier and, as a result, preserve vision. The study population was drawn from patients with a diagnosis of wet AMD, designated by first anti-VEGF injection, between January 2013 and June 2017. Included patients were identified by ICD-9 or ICD-10 code during the study period and had received at least two anti-VEGF intravitreal injections in the study eye(s) fewer than 45 days apart. Patients who received anti-VEGF injections in the study eye(s) before a diagnosis of wet AMD was made were excluded. More than 160,000 eyes were analyzed. Figure 1. 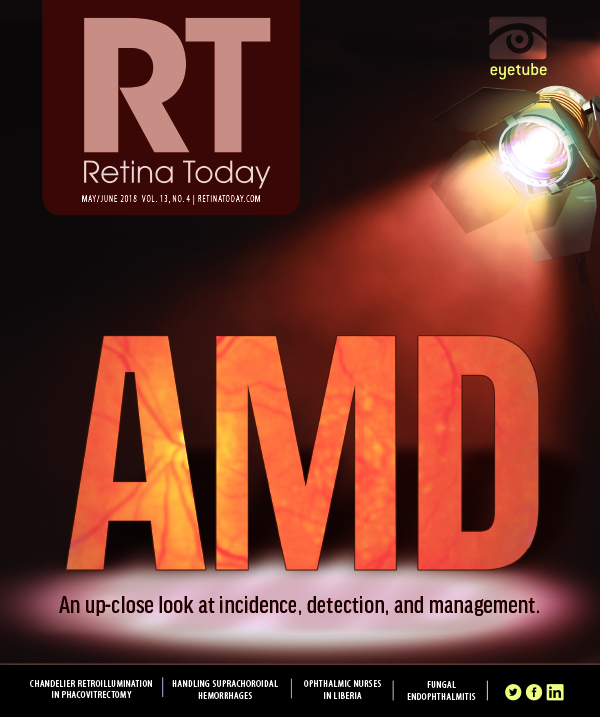 Visual acuity and new-onset AMD in clinical trials. Figure 2. Baseline VA and wet AMD diagnosis in IRIS analysis. Over the long term, the IRIS Registry confirms that, in terms of VA, where an eye starts predicts where it will end. For example, the group with the worst baseline VA (less than 20/32) experienced large relative visual improvement but still ended with the poorest vision at 1 year. Although eyes with 20/25 or better VA at baseline declined somewhat, they still had the best absolute vision at 1 year (Figure 3). VA is an important efficacy outcome when evaluating anti-VEGF clinical trials or choosing a therapy, but letters of vision gained is not a practical endpoint for patients. Our patients want a good quality of life and expect a visual outcome that preserves their functional independence for reading, driving, and enjoying daily activities. That is what truly matters to them. The use of telemedicine and home monitoring to identify wet AMD earlier in at-risk patients was validated in the AREDS2-HOME study.7 A total of 1,520 patients were randomly assigned to test their eyes daily with the ForeseeHome AMD Monitoring Program (Notal Vision) plus standard testing or to standard care alone, based on the investigator’s preference. Among the participants who used the ForeseeHome preferential hyperacuity perimetry test at the recommended frequency, 94% maintained 20/40 or better VA at the time of CNV detection, compared with 62% of patients in the control arm using traditional detection methods. The study was stopped early due to the clinically significant efficacy of the ForeseeHome program. Telemonitoring, or home monitoring, technologies such as the ForeseeHome AMD Monitoring Program can be highly sensitive, are objective, and offer the convenience of at-home testing. Additional insights on which patients may benefit from at-home testing and monitoring are discussed in the sidebar “Who to Monitor” (below). Figure 3. Baseline VA predicts long-term outcomes. Other mobile and digital technologies have been introduced to enhance patient monitoring, such as Paxos Telehealth Solution (DigiSight Technologies), which is a comprehensive provider-to-provider telehealth solution designed for ophthalmic consultations within and across health systems. This product includes a HIPAA-compliant cloud-based portal, a vision assessment smartphone application, a mobile imaging device, and analytics that allow physicians to monitor patient data in real time. The mVT (myVisionTrack) App (Vital Art and Science) is an FDA-cleared vision monitoring application that is prescribed to patients by their doctors to track the progression of AMD and diabetic eye disease. Patient test data are automatically uploaded to the physician’s portal and monitored. Physicians receive alerts when any significant change in the patient’s vision is detected. Based on the AREDS Research Group’s simplified scoring system,1 each eye is assigned one risk factor for the presence of one or more large (≥ 125 µm) drusen and one risk factor for the presence of any pigment abnormality. Risk factors are added across each eye, yielding a 5-step scale (0-4) on which the approximate 5-year risk of developing advanced AMD in at least one eye increases. Patients with three and four risk factors should be monitored closely. Any patient for whom AREDS2 supplementation is recommended could benefit from telemonitoring. 1. Age-related Eye Disease Study Research Group. A simplified severity scale for age-related macular degeneration. Arch Ophthalmol. 2005;123(11):1570-1574. 1. Liu TY, Shah AR, Del Priore LV. Progression of lesion size in untreated eyes with exudative age-related macular degeneration: a meta-analysis using Lineweaver-Burk plots. JAMA Ophthalmol. 2013;131(3):335-340. 2. Ying GS, Huang J, Maguire MG, et al; Comparison of Age-related Macular Degeneration Treatments Trials Research Group. Baseline predictors for one-year visual outcomes with ranibizumab or bevacizumab for neovascular age-related macular degeneration. Ophthalmology. 2013;120(1):122-129. 3. Ying GS, Maguire MG, Daniel E, et al; Comparison of Age-Related Macular Degeneration Treatments Trials (CATT) Research Group. Association of baseline characteristics and early vision response with 2-year vision outcomes in the Comparison of AMD Treatments Trials (CATT). Ophthalmology. 2015;122(12):2523-2531.e1. 4. Ho AC. Retrospective analysis of real-world disease detection and visual acuity outcomes in patients with dry AMD converting to wet AMD using the AAO IRIS Registry database. Paper presented at: ASCRS Retina; April 15, 2018; Washington, DC. 5. Rao P, Lum F, Wood K, et al. Real-world vision in age-related macular degeneration patients treated with single anti-VEGF drug type for 1 year in the IRIS registry. Ophthalmology. 2018;125(4):522-528. 6. Ho AC, Albini TA, Brown DM, Boyer DS, Regillo CD, Heier JS. The potential importance of detection of neovascular age-related macular degeneration when visual acuity is relatively good. JAMA Ophthalmol. 2017;135(3):268-273. 7. Chew EY, Clemons TE, Bressler SB, et al; AREDS2-HOME Study Research Group. Randomized trial of a home monitoring system for early detection of choroidal neovascularization home monitoring of the Eye (HOME) study. Ophthalmology. 2014;121:535-544.